Toyota Motorsport has announced they will be building and supplying a number of GT86 R3 rally cars to private customers. The R3 specification means it will be able to enter FIA sanctioned rallies. The GT86 will get a 6-speed sequential gearbox and an upgraded engine as well as suspension, brake and other mods. Prices and further specs will be released soon. For now we can only hope Toyota decide to take the GT86 to the top level of rallying and into the WRC. With it's fine handling, rear wheel drive and oversteery nature the GT86 will make a for sensational rally car. 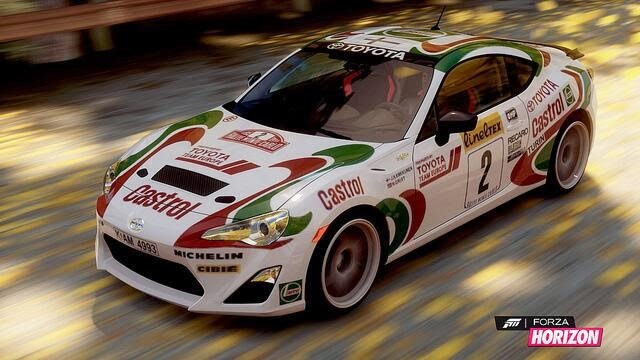 The image is a render posted by Scott Brownlee, @ToyotaPR, on Twitter which he'd obviously taken from Forza Horizon.